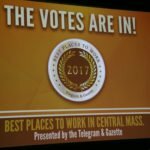 BEST BOSS CATEGORY, SMALL BUSINESS, CENTRAL MASSACHUSETTS. I was extremely humbled to be nominated and be a Top 3 finalist for Best Boss Small Business hosted by the Worcester Telegram and Gazette on April 20th 2017 at Founder’s Hall St John’s High School, Shrewsbury, MA 01545. The pictures speak for themselves.